Dae-Ho Lee hit a two-run home run with two outs in the bottom of the 10th inning to give the Mariners a 4-2 victory over the Rangers on Wednesday at Safeco Field. Nelson Cruz started the rally with one out against reliever Jake Diekman with a wicked shot up the middle that got through second baseman Rougned Odor for an error. Kyle Seagerthen forced Cruz out with a slow grounder to third baseman Adrian Beltre. Lee followed with his second Major League home run on an 0-2 fastball that registered at 97 mph. Lee, the Korean-born slugger who signed as a free agent after years playing in Japan, became the first Mariners rookie in club history to hit a pinch-hit walk-off homer. "I don't know how he got on top of that pitch," Mariners manager Scott Servais said. "But that says a lot for his ability." "There was zero execution on that pitch," Diekman said. Robinson Cano broke out of his homestand slump with a fifth-inning home run off of Rangers starter A.J. Griffin to give the Mariners a 2-1 lead. Cano was 2-for-21 on the six-game homestand before that long ball. The Rangers tied it in the eighth when Delino DeShields hit a leadoff home run against Mariners reliever Joel Peralta. It was DeShields' first home run of the season and third of his career. Mariners starter Taijuan Walker held the Rangers to one run over six innings, throwing 108 pitches, which ties his career high in a single game. He allowed five hits and two walks while striking out four. Griffin allowed two runs in five innings on three hits, four walks and five strikeouts. One of those runs was unearned, as Norichika Aoki led off the third with a fly ball down the left-field line that Ian Desmond dropped for a two-base error. Aoki scored on a single by Seth Smith. 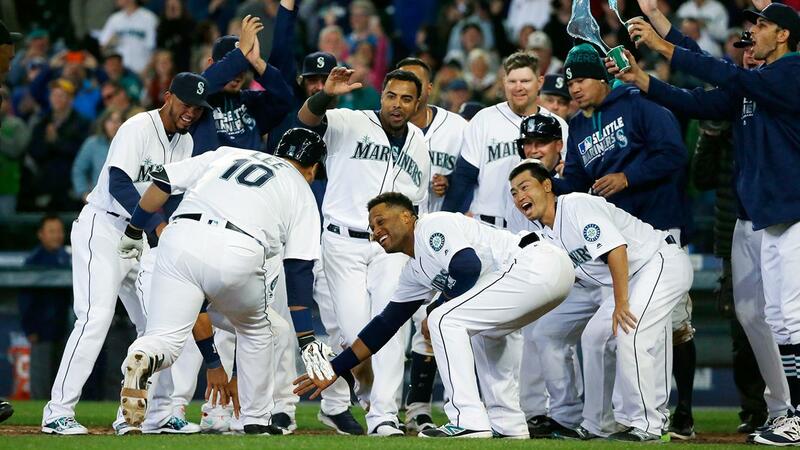 The Mariners' victory snapped their five-game losing streak. All five losses were at home, the longest such streak to start the season in club history. "Exciting game," Servais said. "We really, really needed it." Mariners can't get out on DeShields: DeShields scored the Rangers' first run in the third, scoring on a single by Beltre. The Mariners thought they had DeShields out twice in the inning but didn't get a call. DeShields beat out an infield single to start the inning, and the Mariners lost a replay challenge on a close play at first. Nomar Mazara then appeared to hit a double-play grounder at second baseman Cano, but umpire Jeff Nelson ruled shortstopKetel Marte came off the bag and DeShields was safe. Cano connects: Cano gave the Mariners a 2-1 lead in the bottom of the fifth inning, breaking a tie with a long home run to right field off Griffin. It was Cano's American League-leading fifth homer of the season. Cano did not hit his fifth homer of last season until July 1. More fun with DeShields at second: DeShields singled with one out in the fifth. Mazara followed with a grounder to Cano, who tried to tag DeShields and missed. Cano then threw to first baseman Adam Lind for the out. Lind then threw to second to get DeShields, who was unaware that he had been called safe on the missed tag. "We had a couple of baserunning mistakes and had a couple of scoring opportunities to score more runs," Rangers manager Jeff Banister said. "I felt our guys battled, we just came up short." Rangers lose ninth-inning review: The Rangers lost a a ninth-inning challenge when second baseman Rougned Odor was thrown out at first base on a close play with two outs. The Rangers challenged, but the call was upheld after review. Cishek comes up big: The Mariners were counting on a bounce-back year from closerSteve Cishek when they signed him as a free agent. Cishek delivered in a big way, entering in the ninth, pitching two perfect innings and striking out three batters for his first win of the year. Rangers: The Rangers open a four-game series against the Orioles with Cole Hamels on the mound at 7:05 p.m. CT Thursday at Globe Life Park. Hamels has a nine-game winning streak, the longest of his career. Mariners: Seattle gets an off-day on Thursday to travel to New York, where they will take on the Yankees over the weekend. Right-hander Nathan Karns gets the start in Friday's series opener at 4:05 p.m. PT on Jackie Robinson Day.